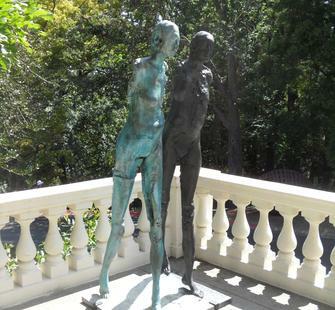 The theme of couples and duality is a reoccurring motif in the work of internationally acclaimed American sculptor Stephen De Staebler. The armless torsos of the two figures in Two Women Walking convey physical and psychic affliction. Yet their juxtaposition also suggests that companionship can be a source of healing: we can find solace both in one another and in the knowledge that the struggles of human existence are something we share.